These last lines might have been inspired by my recent head cold… They are also a reminder why I don’t spend winters in the UK. The lively and colorful holiday season is a wonderful way to end the year on a high note and be thankful for everyone that has come into our lives. And as 2017 comes to a close, I’d like to send out a great big thank you to everyone who has helped me make this a great year. Thank you for your comments and encouragement in response to my posts. Thank you for buying my books and writing those all-important book reviews on Amazon and Goodreads. 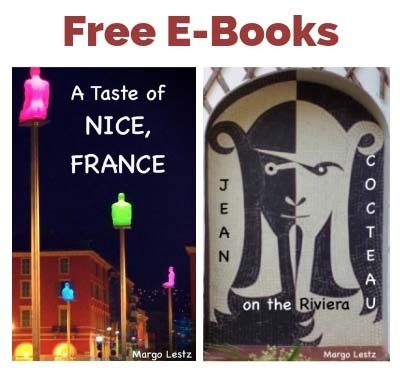 Thanks to those who have helped to spread my articles to a wider audience: Good Life France, Perfectly Provence, Riviera Reporter, A French Collection, Lou Messugo, and others. Thanks to the ladies in my writing group who have read and critiqued my books. Thanks to my husband, Jeff, for proofreading all of my posts and putting up with me all year long. 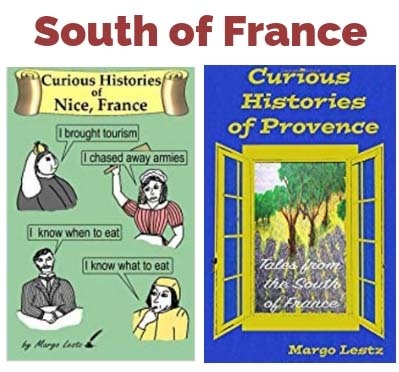 I spent the first part of 2017 furiously finishing up my third book, Curious Histories of Provence: Tales of the South of France, which went to print in May. In June we had a great “Meet the Authors” event in Nice with 8 authors presenting their works to a full house, and lots of books were sold. After that I went to the UK where I spent most of the summer. We bought a new apartment in central London, and we were “gypsies” for 6 weeks while we had some remodeling done. I’m glad to report that we are now all settled in. What’s Next? Well, next spring our London flat will become our permanent home and I’ll be moving from France. For the past 10 years, we’ve divided our time between London and Nice, but it’s time for a change. London is a great city which has so many curious tales for me to discover. You’ll probably be seeing more articles about London on my blog, but if you are a “France-aholic” don’t worry. 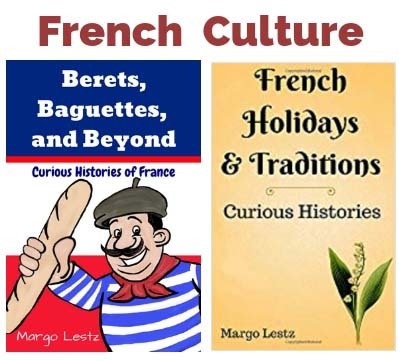 I still have a long list of French stories to write and I think I have at least another book or two about France left in me. Again, thank you to everyone who has touched my life in some way this year. I hope you will have a wonderful holiday season, whether you are being festive or just taking the opportunity to spend some relaxing, quiet time. My wish for you is that 2018 will be an amazing year, filled with joy and happiness. Since I can’t leave you without a little holiday history, read on to find out about those crazy, British Christmas crackers. What is a Christmas Cracker? Basically, a Christmas cracker is a cardboard tube wrapped in festive paper with a surprise inside. Usually each person at the table has their own cracker and gets help from a neighbor to open it. It takes two people to open a cracker: Each person pulls one end of the paper until the tube breaks with a snap and the prizes spill out: You usually get a small trinket, a paper crown, and a little slip of paper with a really corny joke printed on it. It’s fun… and a bit quirky! How Did This Curious Custom Begin? In the mid 1800s there was a man named Tom Smith who had a shop in London where he made and sold cakes, candies, and a variety of sweet things. On a visit to France, he saw what the French were calling “bon-bons” – little candies wrapped in decorative papers tied at each end with ribbons. Tom thought these lovely, little items might sell in his London shop, so he began wrapping up small sweets in pretty paper with the added touch of a little messages of love inside. He sold a few, but basically the idea was a flop. One night Tom was home sitting by the fire and contemplating his sweet idea that had gone nowhere. Just then, one of the logs in the fireplace popped and he jumped – then he smiled. What if he could make his little packages pop when they were opened? He started experimenting with tubes and silver fulminate-lined paper. He had to find just the right “pop” – somewhere between an uninspiring snap and a dangerous explosion. The tubes got bigger, he added little prizes instead of sweets, and the sappy love poems turned into really silly jokes – the kind that make everyone moan. After the sound effects were added, Tom’s invention came to be known as a “cracker” and his sales exploded. They could be used for any occasion, but they became an integral part of a British Christmas celebration. *Don’t Miss Anything – If you would like to receive an email every time I post an article (2-3 times per month), sign up to follow The Curious Rambler. You’ll find the button just above my photo. And, of course, you can always leave a comment below. Thank you for reading. Happy Holidays to you Margo! Thank you Carolyne and all the best to you and yours! What a wonderful, cheery, Christmas post. And from one of those who had the good fortune of sharing a fabulous friendship along with many remarkable writings, I wish you and Jeff a very, Merry Christmas and Happy New Year. I’d also like to add a big, bowl of gratitude for all the help you gave me on pretty much all of my projects and challenges throughout the year. Happy Holidays my friend. Thank you Julia, one of my blessings this year, was getting to spend some time with you. You are a very inspirational woman. Here is to many more happy and healthy years! Hi Janet. Wishing you, Jim, and your whole family a wonderful holiday and a fantastic new year! Thank you, Rose. It was great to catch up the other day. May you have a wonderful and blissful new year! Big hug to you too. Another wonderful piece of history. Christmas Crackers are part of the celebration in Australia too (our British heritage), but I had no idea of their origin. As always, you find the most interesting things. Something for the future could be the British (and Australian) Christmas Turkey. I discovered only recently that this came from American Thanksgiving and only during the 1970s. In Melbourne now and was in the city when that crazy man drove into people on a pedestrian crossing. Not nearly as bad as your dreadful experience in Nice. Have a great Christmas in London and best wishes for the New Year and your new life. Hi Paula, glad you enjoyed the Christmas cracker history. I’ll add the turkey to my list of ideas for future articles – thanks for the suggestion. I was so sorry to hear about the latest incident in Melbourne. Let’s hope that 2018 will be a more peaceful year for everyone.